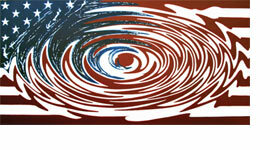 Art Murmur Gallery is pleased to present the group exhibition "AMERICA - are we drowning?" - an investigation of artistic attitudes toward the current state of the union. Artists have been invited to submit work that reflects a variety of issues confronting Americans four years after 9/11. Accompanying the show will be an ongoing "American Idol" style competition, in which visitors to the gallery vote on their favorite works, with the winner honored at the show's conclusion. The World Trade Center attacks and the subsequent "War on Terror" can be considered the starting point of two parallel processes: The ongoing war in Iraq, and the hurricane relief disasters. Presently the war in Iraq has this country sharply divided. On the one hand, many see the war as a mounting quagmire with no easy resolution. It has many Americans now questioning their government's early rationale for initiating the conflict. And more recently, alleged high-level illegal activity has further threatened to undermine that rationale. On the other hand, supporters view our involvement in Iraq as a liberation mission. They see Saddam Hussein as a tyrant who needed to be overthrown, regardless of the lack of proof of his involvement in the 9/11 attacks, and despite our failure to uncover any weapons of mass destruction. Hurricane Katrina brought to light simmering racial, economic and cultural divides overlooked in this country since 9/11. Some would say that a major American city was nearly destroyed as our government, otherwise engaged with its stated mission of fighting terrorism and an increasingly problematic war, was unable to respond in a timely and effective fashion to a natural cataclysm on its own shores. Others view the hurricanes simply as natural catastrophes that the government on all levels scrambled to contain. Other recent concerns that divide our citizens include the fate of the Supreme Court and by extension controversial rulings such as Roe vs. Wade; the energy crisis and government's role; and fiscal issues such as the ever-increasing national deficit and failing systems of healthcare and social security. It is this moment of conflicting visions of America that our artists seek to portray. Participating artists include: Sara Adina, Francois Beausoleil, Andrew Berends, Dave Burns, Jason Chase, Wayne Coe, Andrew Dorado, David Ezzidine, Alex Feliciano, Sam Frazier, Owen Freeman, Mariam Ghani, Kyle Goen, Leandra Hinrichs, Robert Lebsac, Marco Nunes, Greg Santos, Justin Segal, Ozlem Silverstein, Janna Stern, Dan Tague, Gilbert Weingourt, Joel Woodman, and Yoffy.